We must understand the impact of these trends on women’s lives. 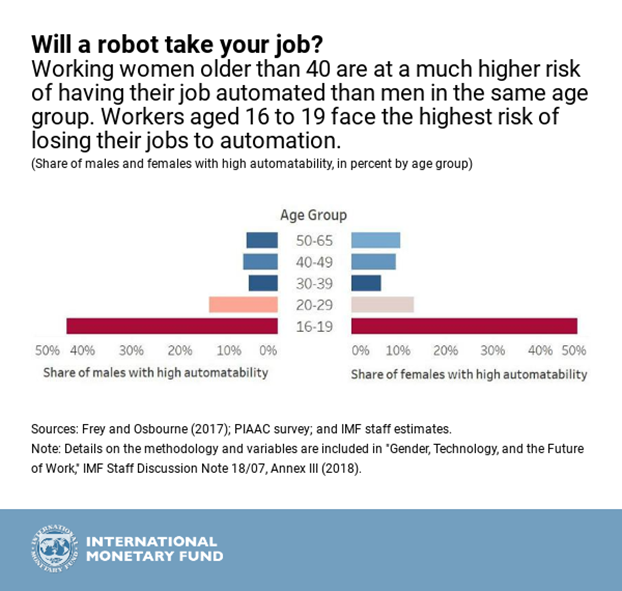 Women who are 40 and older, and those in clerical, service, and sales positions are disproportionately at risk.Nearly 50 percent of women with a high school education, or less, are at high risk of their jobs being automated, compared to 40 percent of men. The risk for women with a bachelor’s degree or higher is 1 percent. Provide women with the right skills. Early investment in women in STEM fields, like the program Girls Who Codein the US, along with peer mentoring, can help break down gender stereotypes and increase women in scientific fields. Tax deductions for training those already in the workforce, like in the Netherlands, and portable individual learning accounts, like in France, could help remove barriers to lifelong learning.Close gender gaps in leadership positions. Providing affordable childcare and replacing family taxation with individual taxation, like in Canada and Italy, can play an important role in boosting women’s career progression. Countries can set relevant recruitment and retention targets for organizations, as well as promotion quotas, like in Norway, and establish mentorship and training programs to promote women into managerial positions.Bridge the digital gender divide. Governments have a role to play through public investment in capital infrastructure and ensuring equal access to finance and connectivity, like in Finland.Ease transitions for workers.Countries can support workers as they change jobs because of automation with training and benefits that are linked to individuals rather than jobs, like the individual training accounts in France and Singapore. Social protection systems will need to adapt to the new forms of work. To address deteriorating income security associated with rapid technological change, some countries may consider expansion of non-contributory pensions and adoption of basic income guarantees may be warranted.